Educational exercise on 'the EU in our daily lives', to be used in the classroom or at school: Find the 12 differences between two images: one with Belgium as (an example of) a member state of the EU, and one showing the same country in the - hypothetical - situation of never having been part of the EU. "How would Belgium - as an EU member - look like if it would never have been part of the EU?" 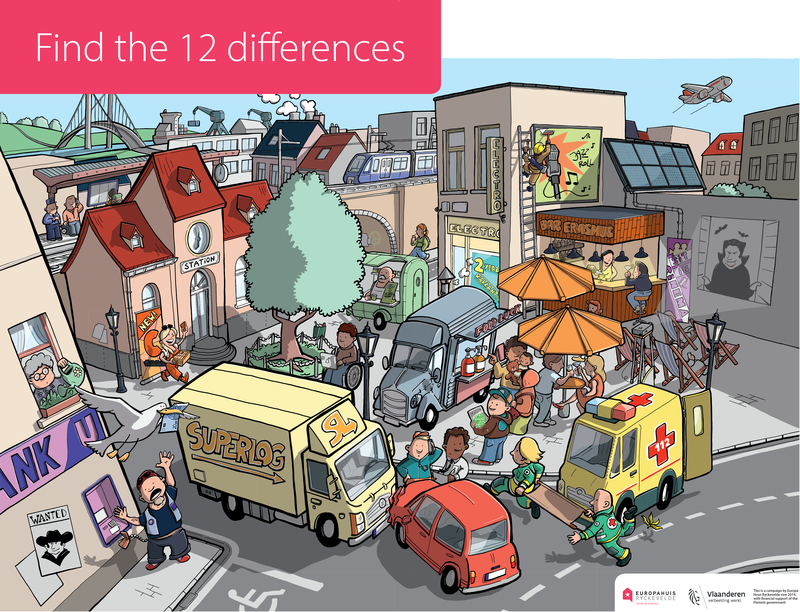 This is the central question you ask yourself when you look for the 12 differences between these drawings. Each difference points out a European decision that affects our daily lives. Below you find the two images and the solution. Both images and the idea are property of Ryckevelde vzw (c) 2019. We allow the non-commercial use of the exercise, but we do not allow any changes or commercial use, without our explicit permission.